Homemade waffles are among the tastiest breakfast foods. Homemade waffles taste so much better than store bought frozen waffles. After you try a homemade waffle, you are likely not going to want to go back. There are a ton of ways that you can make homemade waffles yourself, but trying to make each of the holes by hand is going to take you far too long. Rather than waste your day making the perfect waffle by hand, you should consider picking up a waffle maker. These units come in small household sizes as well as larger industrial sizes, which is great if you have your own restaurant. 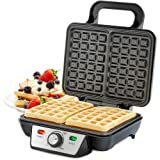 To help you be able to pick up a good quality waffle maker, we have created this buying guide that you can use to be able to pick out one of the best waffle makers on the market. 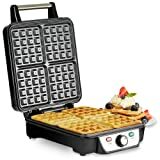 Top 5 Best Waffle Makers (2018) - Our Picks! What sort of a budget do I need to get a good quality waffle maker? This really depends on the size of the waffle maker that you want to pick up. If you have a large family or if you want to be able to cook a lot of waffles, you should have a higher budget for a unit or you or your guests are going to be waiting quite some time for their food to be done. 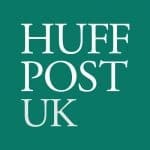 Generally, you will find that waffle makers start at around £20 for the cheap waffle maker options and if you want something industrial, you could spend upwards of £300 for something that is of a professional quality. The more money you spend, you will find that there are more features included in the gadget, which can help you be able to create a better tasting waffle. What sorts of features should I look for in one of these? The most basic models on the market will normally consist of a top and a bottom that you simply compress together and wait until the waffle is cooked. Once a waffle is cooked, you will generally find that there is a LED light or an alarm that goes off to inform you about your cooked waffles. If you want features, you will likely have to pay a bit more money, but it can definitely pay off in waffle quality. 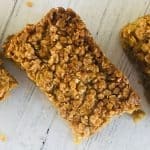 Be on the lookout for products that use a non-stick surface as this will allow you to be able to create healthier oil-free waffles and it will even make clean up easier. Another thing that you may want to keep your eyes peeled for is adjustable temperature control on a waffle maker. 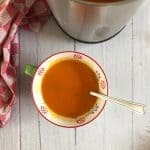 This will allow you to be able to brown your waffles as much as you like, which is definitely a step up from waffle makers designed to cook for the same period of time and at the same temperature. One final premium feature you may want to look for is a waffle maker that has built in settings designed to be used for different kinds of batter. This is a feature that you may have a tough time finding on cheaper waffle makers, but it definitely makes things a lot easier for you. Should I get one that makes circle or rectangular waffles? It doesn’t really matter whether you pick up a square or a circular waffle maker. What does matter, is that the waffle maker disperses the liquid on the unit evenly so that your waffle is made properly each time. Depending on the size and the price of the unit, this is done in different ways. Generally, you are going to have to pour the liquid on the unit and it will disperse on its own over to the various holes until the waffle shape is made. 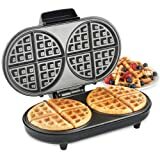 Look for a waffle maker that has large grooves going to the various corners of the unit as this is what will help the liquid to disperse evenly throughout the entire waffle. Are there waffle makers that help with overflow? Although you are likely going to be paying a bit of a higher price tag to get a model that helps deal with overflow, they do in fact exist. These units have a “moat” on the outside of them that allows the unit to be able to capture overflow liquid. You won’t have to worry about your bad pouring if you decide to pick up one of these units and you are also going to have a lot less of a mess to clean up once you are done making waffles. You may definitely want to keep your eyes peeled for this premium feature. What do I look for in terms of storage for the unit? If you buy a large waffle maker, you may want to check to see if the unit is capable of folding or standing up right so that you can store the unit. When a waffle maker is not folded upright it can definitely take up a lot of cupboard space and if you have limited space then this could be a deal breaker. If you really want to make sure that you have sufficient space for your waffle maker most of the time the manufacturer will include dimensions in their product description, which may be something you should take a quick look at. Another quick thing that you may want to take a look for is some kind of a cord spool so that you don’t have a loose cord lying around taking up excess space. What kind of design should I look for? Waffle makers are made out of all sorts of different materials and determining what color you should look for really depends on your budget and what you are going to do with the unit. If you want to be able to leave the waffle maker out on the counter at all times, you may want to spend a bit more money on a unit and get something that matches the rest of your kitchen. There are plenty of black as well as stainless steel designs available and if you take a look around, you shouldn’t have too hard of a time finding something that works for your space. If you plan to just keep the waffle maker inside of your cupboard on a regular basis, you can probably forget about trying to match colors and just try to pick up something that is available for a good price and that is of a good quality. It really depends on your situation and how much you are going to be using the unit, whether or not design is a factor you should consider. Should I take a look at how the unit cleans? If you want something that is convenient, you should definitely make sure that you take a look at how the waffle maker is cleaned. Some units, you simply have to pop out the middle portion and throw it in the dishwasher, but other units you may have to clean by hand. How easy a waffle maker is to clean is definitely a deal breaker for some people, but it can also be a good way to decide between a few different units if you already have your options narrowed down. Make sure to keep this in the back of your mind when choosing your waffle maker. 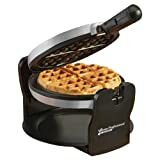 Should I pick up a waffle maker that is a multi-purpose design? There are plenty of waffle makers on the market designed to be able to be used for various purposes other than making waffles. Usually, you will find that these multi-purpose designs have more than one burner in their design, which allows you to be able to do things like cook flat pancakes or eggs. If you are planning to take your waffle maker with you to do things like camping, you may definitely want to consider picking up a waffle maker that has this in its design. You may pay a higher price for a unit that is capable of cooking different types of food, but you are likely saving money by not having to purchase a separate flat cooking stove to cook your eggs and pancakes on. Are temperature controls important to look for on a waffle maker? This really depends on how particular you are about your waffles. The problem with cheaper waffle makers is that they will often beep at you when they are supposed to be done and even if you leave the waffle in the unit, you don’t really know how long you should leave it for to get a perfect waffle. If you buy a more expensive waffle maker once you figure out how brown you like it and the cooking temperature that works the best, you are going to be able to make perfect waffles each and every time. 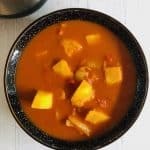 The other main benefit to a unit that has temperature controls is that it allows you to be able to cook other things in the unit if you desire. Some people like to try things like waffle eggs, bread, pancakes, pitas and all sorts of different things. What should I look for in terms of safety features? This is an extremely important safety measure that you should make sure you look for in a unit. Something has to allow you to be able to safely turn the waffle over to cook it properly and a handle is just the thing to do that. Look for something that is easy to grip and that is far away from the heat so that you don’t burn yourself. This is a safety measure that you will find in some waffle maker designs. The feature allows the unit to turn off under its own power in the case you forget. This is an ideal function to have if you want peace of mind. You won’t have to worry as much if you accidentally leave the unit plugged in and leave the house, however, you definitely should never count on such features. This is usually what waffle maker manufacturers put into their waffle makers to inform you that a waffle that is done being cooked. A good quality unit will put large indicators or more than one indicator as it is a fire hazard if you leave a waffle cooking for a really long period of time. What kind of a warranty should I look for? When you are searching around and looking at various waffle makers, you may definitely want to make sure that you have a glance at the warranty period for the unit. The longer the warranty is, the longer you are protected against defects in the unit. Especially if you are planning to pick up an industrial size unit for your store, you should expect to get a reasonable warranty for the price that you pay. Be on the lookout for products that have warranties that are at least a year long. This way, there will be plenty of time for defects to show up in the waffle maker allowing you to have time to find them and get your waffle maker fixed or exchanged. After reading through our waffle maker buying guide, we hope that you now feel as though you will have an easier time being able to pick out a waffle maker. 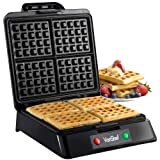 Not knowing the importance of features can really have a big impact on the quality of your waffle maker and it is definitely important to make sure you look at the finer details if you want the best waffle maker within your budget. We wish you the best of luck in finding yourself a new waffle maker and we hope that you get the chance to make some delicious homemade waffles very soon!